Located in a former Nashville Auto Diesel College outbuilding at the corner of Douglas Avenue and Gallatin Pike in East Nashville, BATL, or Backyard Axe Throwing League, provides the opportunity to hang out, grab some food and a drink – and hurl axes at targets with friends, coworkers or even in league play. It’s the second East Nashville location for general manager Jonathan League, who became intrigued with the sport after stumbling across some online information a few years ago and folded it into his business-school studies at Belmont University. “I got laid off five years ago from a job I took after my military service,” says League, who served for more than seven years in the U.S. Army, including three tours in Iraq and Afghanistan as an aviation mechanic. Axe throwing coach Jason Augspurger helps Aubrey Galbraith, left, and Rebecca Smith as they prepare to unleash axes fore the first time at BATL Nashville. What began as a class project quickly morphed into a bona fide business thanks to his having access to a friend’s events venue in East Nashville. The space hosted all kinds of private events, and through relationships League made there, he soon was in the process of creating Throw Nashville, his own axe-wielding operation. Match: Sometimes referred to as a game, is a set of three rounds totaling 15 throws. Round: One set of five throws, three of these make up a match. Perfect round: All 5 throws are bullseyes, totaling 25 points. Perimeter wall: The four-foot wall that separates throwers from spectators. Fencing: 9-gauge, heavy chain link fencing to separate the lanes from one another and the outside social area. Target: Five 2x10 boards screwed to a backboard comprising four-point areas. Helmet: There is a lower and an upper helmet on each lane. The upper is made of high density rubber and the lower of wood mounted below the target. Helmets protect axe heads from damage on a missed throw. Yellow (perimeter) line: Represents the separation of the throwing arena and the viewing area. Spectators are not to cross this line. Big axe: The full-size felling axe used for tie-breakers. Big axes are 2.5 pounds with a 27- to 28-inch wooden handle. Device: A set of Vernier calipers used in measuring the point score for instances when an axe sticks between two ring values on a target. His belief in the concept’s viability was further enhanced by an afternoon spent with a friend he ran into that same day. After hearing the friend wasn’t feeling well and was slightly depressed, League asked him over for some throwing. Not long after opening in April 2017, League began corresponding with Matt Wilson, the founder of Toronto-based BATL, about how they could get Nashville on board with leagues and other activities. A partnership was struck, and the search for a new venue began. The Gallatin Pike site was chosen, and it has been undergoing extensive renovation in recent months ahead of a May opening. The expansion into Nashville is an exciting development for Wilson, who says that BATL, along with the National Axe Federation (NATF), which created a standard rule system for play and competition and has more than 3,000 league members in more than 50 cities and five countries, is finding a welcome home in many communities in the lower 48. 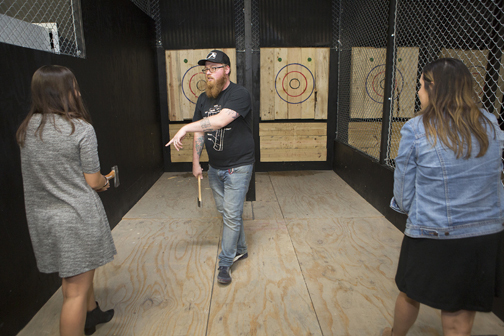 As a sport, axe throwing fosters camaraderie through physical activity. Wilson says the social aspect is just as engaging as the hurling itself. Hence, the leagues. 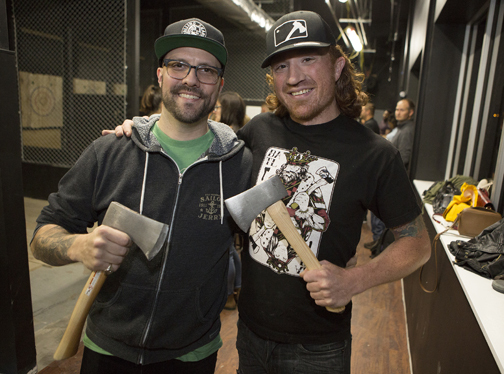 Matt Wilson, left, CEO and founder, and General Manager Jonathan League at BATL Backyard Axe Throwing League in East Nashville. “It actually started as a league, and that formed the backbone of BATL as a business,” he explains. “It was a weekend activity, then some evenings during the week, and the competition aspect grew. So: axes, liquor … insurance? The Nashville operation will be BATL’s southern-most outpost, at least for now. That’ll change when new spots in Scottsdale, Houston and Jacksonville open, joining other sites in Detroit and Chicago. 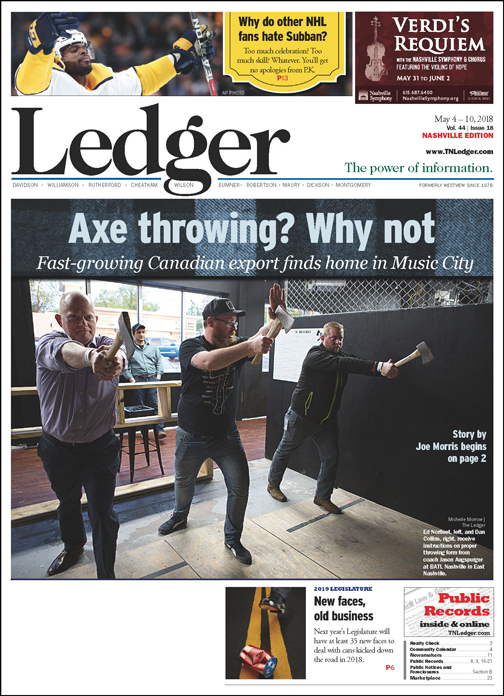 That kind of growth is encouraging to League, who learned in his first year of operations that there’s plenty of interest in axe throwing here in Music City. “I started out thinking just about the bachelor and bachelorette parties, but the opportunity came up for corporate team building and private parties and we’ve just kept going,” League explains. And, he adds, the more varied the clientele, the more people learn that axe throwing isn’t any more dangerous than, say, bowling. All fretting aside, League says he is certain that BATL Nashville can not only hold its own as a local entertainment option, soon it will lead the pack as far as revenue and activity across the growing chain. “I want to be the No. 1-producing BATL venue, and so I’ve got to work on building relationships in the area,” he says. “But there are 1.6 million people in and around Nashville, and even more visit, so if I can get 100 people in for a three-hour block, that’s 400 people throughout the day … I can get some pretty big numbers.